Trying to find the answer to what the best longboard sliding gloves are is pretty much the same as trying to ask a parent which child they love most. There is really no straightforward answer. Each pair of slide gloves brings with it different pros and cons. It is a matter of what your preferences are. For example, are you looking for a glove that is low-profile, or do you want something a little bit bulkier that is going to add more protection? Are finger pucks and thumb pucks a must or not? What style of finger puck do you want? Do you want one puck that will cover all four fingers, or is a lobster style configuration what you are looking for? The questions could go on and on. For that reason, our goal with this guide is to give you an overall feel for the different styles of slide gloves are available. Hopefully, you can use this information to make an informed decision and purchase the best longboard slide gloves for you. Slide gloves have two purposes. They protect the rider’s hands and allow them to do certain tricks. Slide gloves are made from a lightweight material and usually have a breathable mesh material designed to draw away sweat from the hands on hot days. While having light weight gloves is important, make sure that the gloves you purchase are durable enough to withstand the style of riding you engage in. Two things to look for are gloves that have double stitching and gloves that are made with Kevlar or other composite fabrics. Make sure the gloves you select allow you to grab your longboard while you are sliding. Your gloves should allow you to have a firm, strong grip on the board. Aggressive riders will benefit from gloves that are made with leather and have a padded interior. Every pair of slide gloves must have palm pucks. Many will have removable palm pucks that attach to the gloves with Velcro. Your palm pucks protect your hands, and they will take the most abuse. The palm pucks you use must be of the highest quality. Pucks that are made of a UHMW plastic provide the highest level of protection and will give you enough resistance to control your slide. Slide gloves protect your fingers. Some do this by having Kevlar fingertips, while others use finger pucks. Your style of riding will determine the right type of gloves for you. When wearing slide gloves, good form and technique is important. Keep your palm pucks towards the heel of your palm, and keep your fingers up. This will allow you to apply pressure toward the bottom of the puck, and it will prevent you from jamming your fingers. Now that we have examined what to look for in gloves, let’s take a few minutes and review some of the popular brands of slide gloves are currently available. Providing the perfect mixture of style and function, these hardy gloves feature Kevlar resistant fingertips. Removable slider pucks, slide bars for the fingertips, and a heavy duty Velcro wrist strap work together to provide unparalleled protection. These high-quality gloves are made with top grain leather. Many users commented on how happy they are with the quality of the gloves stating that “the gloves did the trick. They fit well and seemed well-made.” Others commented on how, in addition to providing complete protection, these gloves were flexible enough to allow them to have good movement with their hands and the ability to grip the board during slides. These slide gloves are designed for riders who are looking to push themselves to the limit and stay safe. The Kevlar reinforcement of the gloves gives riders extra protection, and the breathable top mesh makes the gloves comfortable to wear and reduces sweat build up. The Velcro and neoprene wrist strap add additional security and support to the gloves. Add all of that to the ballistic grade nylon construction of the gloves and you can easily see why they are a favorite of so many riders. The UHMW finger pucks and palm pucks offer unprecedented protection and sliding ability. Many Amazon users commented on how well the longboard slide gloves fit. One mother even commented on how the gloves saved her son’s hands during a bad skating accident. 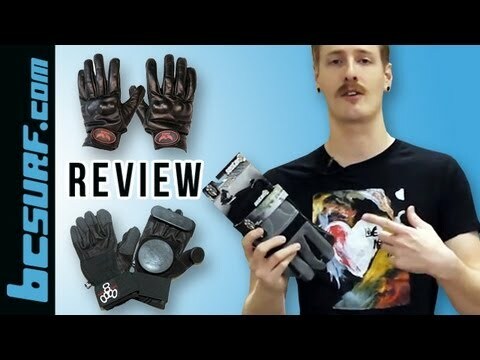 These super lightweight and extremely breathable longboards sliding gloves are designed to get the rider out of the house and bombing hills in no time. These gloves are among some of the softness and affordable sliding gloves available. Riders can enjoy their time on the asphalt knowing that their palms and fingertips are going to be protected. Equipped with three millimeter antivibration foam, durable Kevlar fabric on the fingertips, and a thumb panel to wipe off excess sweat, these gloves are perfect for a novice on their first ride or a professional who has been riding for years. The Delrin Pucks guarantee that every single ride is a smooth ride and that the rider has control of their speed the entire way. As you can see, there are many options available for a rider looking for slide gloves. Slide gloves are as unique as the rider who wears them. So take your time, do your research and find the perfect gloves for you. Not only will they prevent your hands from becoming a victim of road rash, but they will also help you improve your performance and take your riding to the next level.